The establishment of high schools early in the twentieth century, though an important educational advance, benefited only a small fraction of North Carolina's school-age children-most of whom lived in rural settings without access to adequate educational facilities. This fact motivated state superintendent J. Y. Joyner and various farm groups to promote the idea of farm-life schools, which the General Assembly authorized in 1911. If a local governmental unit provided facilities (including dormitories for boys and girls) in the amount of $25,000, then pledged $2,500 for operating expenses each year, the state would match the latter amount. Almost immediately, five counties took advantage of the offer, and by 1916, 21 farm-life schools were in operation. These schools were required to offer a standard high school education in addition to classes and practical experience in vocational agriculture and home economics. In Nash County, local farmer Tom Jones donated 25 acres of land, and the community voted an additional $10,000 in bonds for buildings for the Red Oak Farm-Life High School. Students within walking or horse-riding distances paid no tuition, but boarding students paid $12.50 per month. The boys cut wood for fires, and girls cooked and waited on tables. Crop rotation, contour plowing, selection of nutritious foods, and improved homemaking practices were emphasized along with the academic curriculum. A second school-the Rowan Farm-Life School in China Grove, which opened in 1914-was such a success that in 1921 the regular China Grove High School merged with it and shared the farm campus. Academic standards there were high, and the school distinguished itself in scholastic and vocational fields as well as in extracurricular activities at state and regional levels. In the first quarter of the twentieth century, however, with increased urbanization, the introduction of motorized transportation for students, and the passage of the federal Smith-Hughes Act of 1917 appropriating federal funds for vocational education in public high schools, farm-life schools faded into educational history. "County Farm-Life School Law and Explanations," North Carolina High School Bulletin (April 1911). Zeyland G. McKinney, "The County Farm-Life Schools of North Carolina" (M.A. thesis, Appalachian State University, 1953). 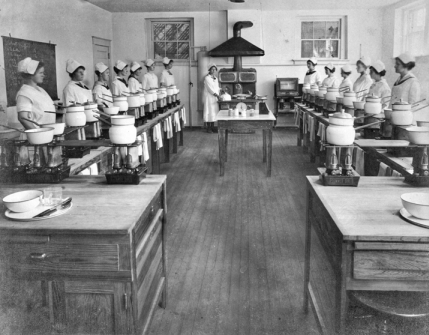 [Kitchen of the Cary Public and Farm-Life School]. Photograph. ca. 1916. North Carolina Office of Archives and History, Raleigh. Please correct. The above picture of the woman stepping onto the bus is Mrs, Mildred Jenkins a teacher at Red Oak Elementary School and not the Red Oak Farm Life school. The Red Oak Farm Life school ended in the 1920's. It then became Red Oak Elementary and Red Oak High School located in two connected brick buildings. I was in the second grade at Red Oak in 1952 and later Mrs. Jenkins was my forth grade teacher. The high school ended in 1966. Thank you for visiting NCpedia and taking the time to share this with us. I appreciate you letting us know about this correction. I have removed the image from the article.